Glossary - this section includes terms used in the ccCBHcc.com website. A1, A2, and A3 - A1 refers to the “A” in STATES in the legend, A2 refers to the first “A” in AMERICA in the legend and A3 refers to the second “A” in AMERICA in the legend. AMBPR - acronym for Auction & Mail Bid Prices Realized. ANS - acronym for American Numismatic Society. Black Cabinet - When a coin collector has a collection of counterfeit coins for their own personal reference, such a collection is generally known as a "black cabinet." and thereby is spread, by impact, beyond its normal dimensions. Argents - Vertical unlined/unraised stripes in shield on reverse (i.e. see also Crossbars and Gules). Cast Copy - contemporary counterfeit Capped Bust half dollar that is cast usually from a plaster mold of a genuine coin. ccCBh (a.k.a. ccCBhd) - acronym used for contemporary counterfeit Capped Bust half dollar. ccCBHcc - acronym for Contemporary Counterfeit Capped Bust Half Collectors Club. Clipping (a.k.a. shaving) - practice by which persons would cut off small amounts of precious metal from a coin's edges. Lettered and reeded edges where used to deter this practice. Contemporary Counterfeit - a coin made approximately the date on the coin that the public will think it is a genuine coin for use in general circulation at its supposed face value. Not to be confused with a counterfeit that is a fake imitating a specific genuine coin meant to fool a coin collector for its numismatic value. Crossbars - Horizontal lines in shield on reverse (i.e. also see Argents and Gules). Numbered from the bottom horizontal line to the top horizontal line for finer reference. Davignon variety (a.k.a. Davignon) - known variety of a contemporary counterfeit Capped Bust half dollar that has been identified by year and specific attributes. The year plus a coding with a number for the obverse and letter(s) for the reverse are used in combination to identify a variety. Die - an engraved stamp used for impressing a design (images, value and mottoes) upon a blank piece of metal to make a coin. Diebreak (a.k.a. die crack) - an area of a coin that is the result of a broken die. This may be triangular or other geometric shape / line. Early dies cracked from use and then, if not removed from service, eventually broke. When the die totally broke apart, the resultant break resulted in a full, or retained, cud depending whether the broken piece fell from the die or not. Discovery Coin (a.k.a. discovery specimen) - first specimen found for a variety. Draped Bust Type half dollar - minted 1796 to 1807. Electrotype - a duplicate coin created by the electrolytic method, in which metal is deposited into a mold made from the original. The obverse and reverse metal shells are then filled with metal and fused together after which the edges sometimes are filed to obscure the seam. Fake (a.k.a. modern fake) - A counterfeit that is a fake imitating a specific genuine coin meant to fool a coin collector for its numismatic value. Not to be confused with a contemporary counterfeit that is a cast or struck coin made approximately at the date on the coin that the public will think it is a genuine coin for use in general circulation at its supposed face value. Field - the portion of a coin's surface not used for design or inscription. Flowing Hair Type half dollar - minted 1794 to 1795. German silver - Dr. Lewis Feuchwanger's metal (a.k.a. Feuchwanger's composition, or German silver). German silver was stated to be a new metal alloy of the 1830s comprised of copper, zinc and nickel. This alloy was even suggested by Dr. Feuchwanger to the US Congress that the metal be used as a substitute for copper to mint small denomination coinage. Gules - Vertical lined/raised stripes in shield on reverse (i.e. see also Argents and Crossbars). Headband - band across the head of Liberty with the word LIBERTY. Hobby Protection Act of 1973 - Federal law that requires the word "COPY“ to be marked legibly, conspicuously, and non deceptively on the obverse or reverse. Hub - coin production term used to refer to a reverse design that is used to make the x dies that strike the coins. Sometimes a punch that is used to stamp the design into the coin die. I Alignment - the letter I in the word Pluribus in the scroll align to the letter(s) in the legend above (i.e. normally ATE in States). Used as an identifying attribute for a contemporary counterfeit variety for a specific year. Incuse - opposite of relief, the part of a coin's design that is pressed into the surface. Les - acronym for left end of scroll’s alignment to the letter(s) of the legend. Used as an identifying attribute for a contemporary counterfeit variety for a specific year. Legend - principal lettering on a coin. In the case of the Capped Bust half dollar the words UNITED STATES OF AMERICA on the reverse. Lettered Edge - the edge of a coin that has lettering on the outside of it. For the Capped Bust half dollar the lettering is incused. Mexican Head Portrait – Liberty distinctive because of wildly exaggerated hair curls. Numismatic theory is that there is a striking connection between these varieties and the predominant style of traditional Mexican art and are speculated to have been minted in Mexico. Mint Error - a coin that was improperly made during its manufacture. Multi-struck - a coin that has evidence of being struck more than once with each strike overlaying the previous strike(s). NC - acronym for "Not Collectable" denoting a unique or nearly unique coin. Numismatic - of or relating to coins or currency. Numismatist - the study or collection of money, coins, and often medals. O-### - Overton reference to a specific genuine Capped Bust half dollar variety unique by year. The letter “O” is followed by an identifying three digit number. “O” Mintmark - mintmark for New Orleans US Mint (from 1838 to 1861 and from 1879 to 1909). Off-center - describes a coin that has received misaligned strike from the coin press and has portions of its design missing. Overton - Reference for genuine varieties of United States early half dollars die varieties from 1794 to 1836 named after the numismatist Albert Charles Overton. PCGS - acronym for the independent professional services company Professional Coin Grading Service. Plain edge - edge without either reeding or lettering. Planchet - the blank piece of metal on which a coin design is stamped. Plate Coin - contemporary counterfeit Capped Bust half dollar specimen for a specific variety that is used as the representative image of the variety in a publication. Rarity Occurrence levels - Contemporary counterfeit Capped Bust half dollar Davignon rarity occurrence levels: 1-2 = Rare, 3-5 = Very Scarce, 6-9 = Scarce, 10-19 = Common, 20-49 = Very Common, 50+ = Extremely Common. Genuine early half dollar rarity occurrence levels (Overton): 1-3 = R.8 Unique or nearly so, 4-12 = R.7 Extremely Rare, 13-30 = R.6 Very Rare, 31-80 = R.5 Rare, 81-200 = R.4 Very Scarce, 201-500 = R.3 Scarce, 501-1000 = R.2 Slight Uncommon, Over 1000 = R.1 Common. Recut - when a die used to mint coins became so worn an element of the design detail that does not appear clear it is “repunched" with the design element to make it clearer, many times still leaving traces of the original worn die element when struck. Reeded Edge - the edge of a coin that has small reed like groove lines on it. 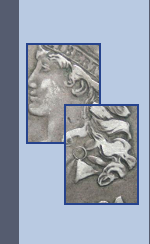 Relief - the part of a coin's design that is raised above the surface, opposite of incuse. Res - acronym for right end of scroll’s alignment to the letter(s) of the legend. Used as an identifying attribute for a contemporary counterfeit variety for a specific year. Riddell’s Monograph - John Riddell in his A Monograph of the Silver Dollar: Good and Bad of 1845 published a list with illustrated facsimiles of the then known half dollar counterfeits. Rim - the raised edge on both sides of a coin (created by the upsetting mill) that helps protect the coin's design from wear. Scroll - found below the legend on the reverse with the words E PLURIBUS UNUM. Segment - identical geometric shape that combined make the raised rim perimeter on both sides of a coin. Serifs - extra stroke at the ends of the character. Shaving (a.k.a. clipping) - practice by which persons would cut off small amounts of precious metal from a coin's edges. Lettered and reeded edges where used to deter this practice. Silver Wash - thin layer of silver over non silver planchet to give the appearance of a silver coin. Spooned Coin - a coin to which it has been repeatedly tapped around its rim reducing its diameter and raising its rim. Star 1 to Star 13 - on the obverse reference to the stars that begin on the lower left and end on the lower right. Star 1 (a.k.a. S1) is on the lowest left. Star 13 (a.k.a. S13) is on the lowest right. Struck copy - contemporary counterfeit Capped Bust half dollar that is minted from a counterfeiter’s hand made dies. An exception is that some contemporary counterfeits are thought to have used dies discarded by the US Mint that were outdated or damaged and sold as was the practice for scrap metal by the Mint. Transfer Die - A die created by sacrificing a coin (genuine) for a model. Unlisted Variety - a suspected contemporary counterfeit Capped Bust half dollar that has not been vetted and given a Davignon identification. White Metal - zinc based metal alloy. Alloy has only been found used in cast contemporary counterfeit Capped Bust halves to date.